A single winner of this Friday's EuroMillions draw would scoop the second-largest jackpot yet. The prize fund has been capped at 190 million euro - meaning a UK ticket holder would win £148 million. It would be the largest pot since Colin and Chris Weir, from Largs in North Ayrshire, won £161 million last July, with the difference in the exchange rate meaning this week's jackpot is slightly less than that. If no one matches all five numbers and two lucky stars, the prize rolls down to those matching five numbers and one star. The last time the jackpot was passed down in that way, seven UK players won £6.7 million each. A EuroMillions spokeswoman said: "This is it - the jackpot has to be won and it promises to be an amazing night. We urge all players to get their tickets early. "Only a couple of weeks ago, we created 100 millionaires in one night and this draw could be another golden night with the potential for several multi-millionaires to be made here in the UK on Friday. "In addition to the chance to win a life-changing prize, these big draws boost returns to National Lottery Good Causes, with players helping to raise over £30 million every week." Once the jackpot has reached the cap - which it did in last night's draw - it can only roll over once before it has to be won. A single winner would be able to buy enough gold to cast 33,000 Olympic gold medals, Camelot said. They would also have a fortune bigger than that of Sir Tom Jones, which is £140 million according to The Sunday Times Rich List. Camelot is still looking for a UK ticket holder who is yet to come forward to claim their £63.8 million EuroMillions prize after hitting the jackpot on June 8. The owner of the ticket, which was bought in the Stevenage and Hitchin area of Hertfordshire, has until December 5 to pick up their prize. The map was commissioned to mark Tuesday night's EuroMillions roll-over which is now a staggering £138 million - the fifth biggest jackpot ever offered in the UK. Should anyone scoop the jackpot, their wealth will be slightly less than Europe's biggest Lottery winners Colin and Chris Weir, from Largs in Ayrshire. 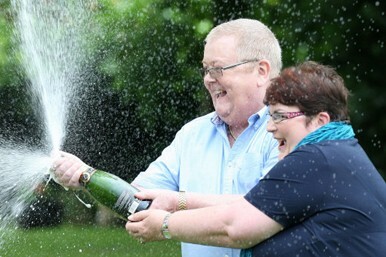 The husband and wife made the headlines in July when they won £161,653,000, thanks to several rollovers. Boasting 164 National Lottery millionaires, one in 14,211 North East residents has now banked a seven-figure jackpot prize. Winners Paul and Christine Goldie from Washington, near Sunderland, pocketed £3,581,481 after their numbers came up on Christmas Day last year. The Millionaire Map, which includes both publicity and non-publicity winners, is based on the number of millionaires created per adult population. One man who did go public with his winnings was Wayne Hughes from Holyhead on Anglesey, north Wales. The shop worker scooped £1,117,779 last August and even had the winning numbers tattooed on his arm. The region with the fewest millionaire jackpot winners was Northern Ireland, where only 53 seven-figure or more winners were created. Wales has seen 179 millionaires - one person in 14,502 - created over the last 16 years. Rugby fans Terry Roberts, Mike Williams, Lance Gifford and Gerwyn Jones, from the Rhondda Valley in south Wales, split £4,091,609 in April this year.